My husband left for 3 weeks of work in Hawaii. He will be working on a home show about luxury swimming pools. (enter Hawaii-ish and jealousy emjois) I wanted to make a nice dinner for him last night with a Hawaiian flair. Turns out, this week is also Hawaiian Food Week. How perfect! 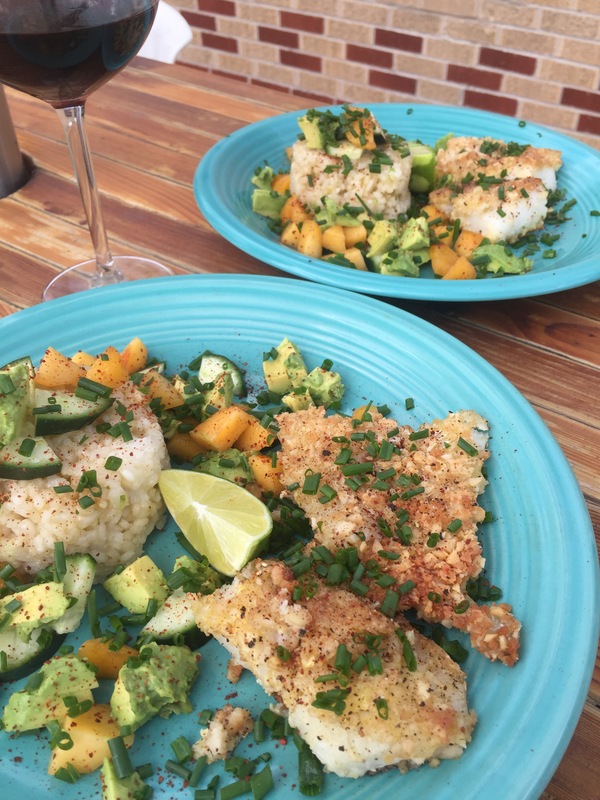 I made macadamia crusted cod with sushi rice and a salad of pineapple, avocado, and cucumber. 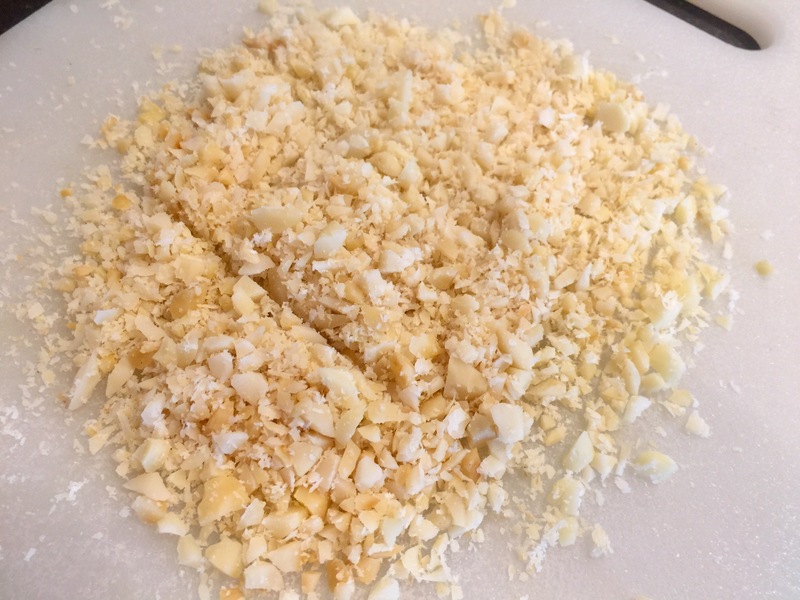 The macadamia nuts are finely chopped and then mixed with some panko bread crumbs for the perfect crunch. The sushi rice is mixed at the very end with some lime zest, coconut aminos, and rice vinegar. The avocado, pineapple, cucumber salad adds the perfect fresh contrast and really makes this dish. I have to be honest though, I used nectarines instead of pineapple because that is what I had. It was fantastic! But this is Hawaiian foods week, so pineapple it is. *a note about sushi rice: This is easy to find now in most grocery stores. I like it for this because it keeps with the Hawaiian theme and I love the sticky texture. 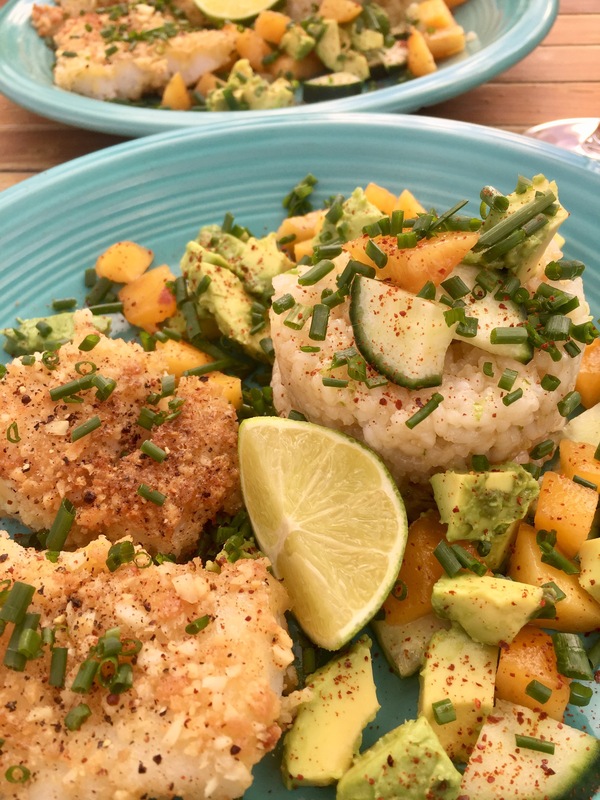 You could definitely substitute regular rice in this dish. Quinoa could be a good choice too if you’re trying to behave yourself. Start the sushi rice. Rinse the rice in a fine mesh strainer until the water runs clear. Then combine with 1 1/2 cups water plus 2 tablespoons in a small saucepan. Sprinkle a little salt in there and turn on high. Once it’s boiling turn it to low for about 10-15 minutes and then turn it off, DON’T PEEK, and let it set for another 15 minutes. My big rice cooking advice is to just not lift the lid. Every time I peek, ruined. season with some salt and pepper and set aside. Mix the egg and water and set aside. Get out the cod and pat it very dry with a towel. 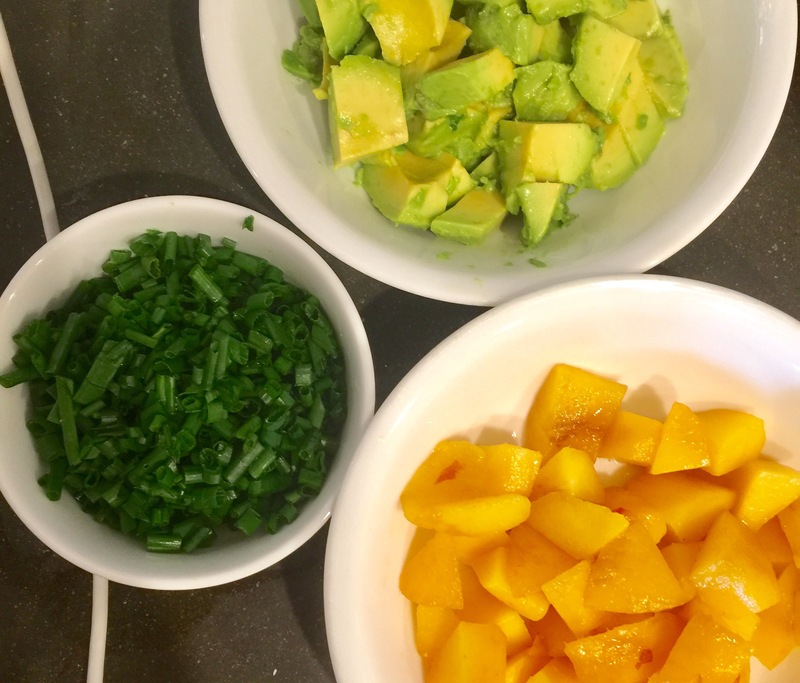 Prep your salad fruits, then mix with the olive oil and season with salt and pepper. ​Transfer to a paper-towel lined plate and season with a little more salt and pepper while it’s hot. Stick it in a 180 degree oven while you mix the rice. Take the rice out of the fridge and mix it with the coconut aminos, rice vinegar, and olive oil. 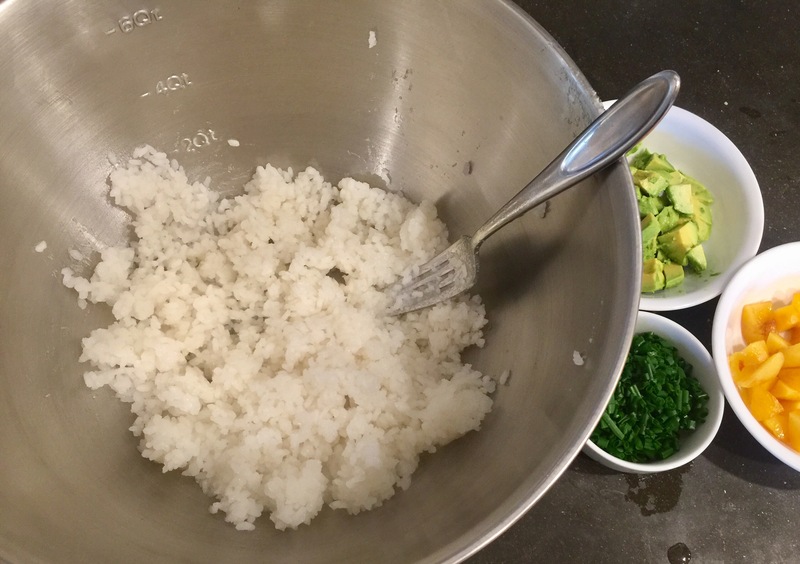 Use a microplane to zest a lime over the bowl and then mix it into the rice. Save that lime to serve with the meal. Time to plate! Use a 2/3 measuring cup to scoop out rice and press it firmly into the cup. Turn it upside down and transfer to a plate to make it look fancy. 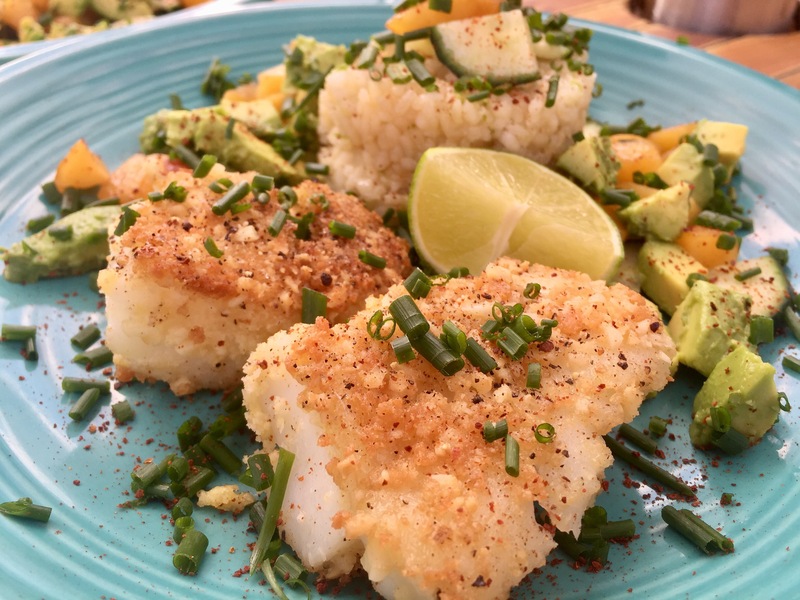 Put the cod on the plate and then spoon the salad over everything. Garnish with green onions or chives, lime wedge and some chili pepper powder. I used gochugaru (Korean pepper flakes), but ground ancho pepper would be good, or a little smoked paprika, or even spicy cayenne pepper. Makes 2 servings with a little extra rice to put in the fridge and to make fried rice with the next day.